← 289 "Little Girl in the Big Ten"
The living room is black and white. Homer, dressed as Charlie Chaplin’s The Tramp character, waddles to the couch and twitches his nose. When Tramp Homer sits down, the rest of the family, dressed as silent movie characters, join him. "The Frying Game" is the twenty-first episode of season 13. It originally aired on May 19, 2002. The episode was written by John Swartzwelder and directed by Michael Polcino. Carmen Electra and Frances Sternhagen guest star. "Homer gets in trouble with the Environmental Protection Agency and is sentenced to community service. He and Marge end up working for Mrs. Bellamy, an elderly socialite, and find themselves accused of another crime...Mrs. Bellamy's murder." For an anniversary gift, Homer gives Marge a Koi Pond for the backyard. The new pond attracts a caterpillar that constantly screams. The "Screamapillar", as the family learns it's called, is an endangered species. According to the Environmental Protection Agency, by law they are responsible for the Screamapillar's well-being because it has chosen to take up residence in their pond. When Homer believes he has accidentally killed the insect, he tries to hide what happened, but the EPA shows up and apprehends him. The Screamapillar is okay, but Homer is found guilty of "attempted insecticide" and "aggravated buggery" and is sentenced to 200 hours of community service. For his community service, Homer delivers Meals on Wheels and is frightened when one of his elderly clients appears to be threatening him with an axe. It turns out she is just a kindly old woman, Mrs. Bellamy, and she asks Homer to join her for some company. She also says she only needs the axe to cut the Meals on Wheels steaks. Homer feels sorry for Mrs. Bellamy because she's an old woman all by herself, and starts lending her a hand around her house. Very soon, she seems to be taking advantage of Homer's kindness as Homer starts spending more and more time at her house and less with Marge and the kids. Marge becomes annoyed at this and confronts Mrs. Bellamy, but then quickly finds herself guilt-tripped into helping the old woman as much as Homer has been. Both of them come to resent being manipulated into becoming, in effect, Mrs. Bellamy's personal servants. When Mrs. Bellamy turns up dead (stabbed with a pair of scissors) and her diamond necklace is stolen, Homer and Marge are considered top suspects—especially when it's discovered that they were named beneficiaries in her will. Homer and Marge suspect the "man with braces", whom they saw leaving the scene with the necklace. Everyone else suspects Marge and Homer. When the necklace is found in the Simpson home, Homer and Marge are arrested. The children are sent to a yokel foster home, and Marge and Homer are put on trial for Mrs. Bellamy's murder. With Gil as their lawyer, they don't have a chance, and they are quickly found guilty and sentenced to death in the electric chair. When Homer realizes that Marge is going to miss the children, he confesses to being solely responsible for the crime, which allows Marge to be released. 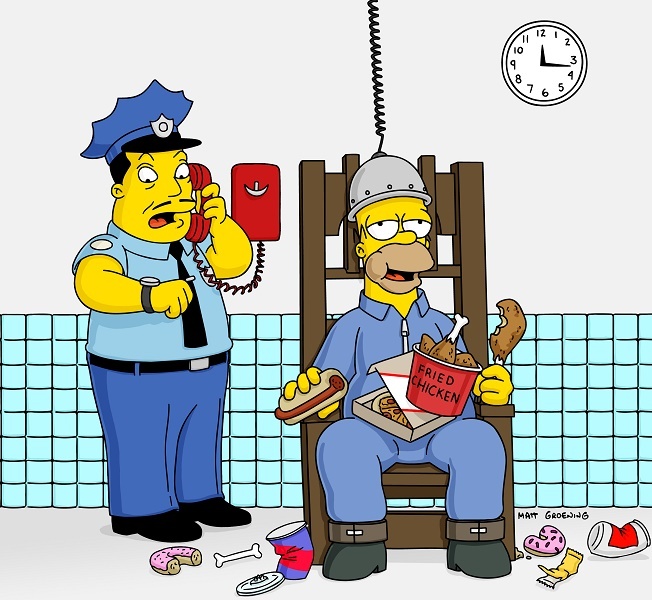 Homer is strapped into the chair and about to be executed when it is revealed he is a participant on a new reality TV show called Frame Up. The man with the braces is the host. As for Mrs. Bellamy, she's still alive, and isn't an old woman at all, but actually co-host Carmen Electra in disguise. Homer is quickly freed and reunited with his family. Chief Wiggum is relieved that he won't have to carry out Homer's execution, but protests about the show's forcing him to use all of the time and resources of the Springfield Police Department on what turned out to not even be a real case, until he realizes he'll be on TV—at which point he tries to get Lou and Eddie producer credits. Homer, for his part, is thoroughly disgusted. He lectures Carmen Electra about the callousness of toying with people's lives for the sake of TV ratings, when she interrupts him: "Homer? My face is up here." He's been looking at her breasts the whole time he's been talking to her. Homer says, "I've made my choice", and continues staring her in the breasts. Modified on May 31, 2017, at 11:06.